To Cite: Skowron K, Grudlewska K, Kaczmarek A, Budzynska A, Reslinski A, et al. Evaluation of the Formation of Single- and Double-Species Biofilms on Intraventricular Catheters by Strains of Staphylococcus aureus, Listeria monocytogenes and Escherichia coli with K1 Antigen, Jundishapur J Microbiol. 2018 ; 11(8):e62323. doi: 10.5812/jjm.62323. Background: Intraventricular catheters (IVCs) are an important diagnostic and therapeutic tool. They are used in patients after traumatic brain injury, intracranial haemorrhage, ventricular, or hydrocephalus. However, the use of IVCs may lead to the development of bacterial brain and cerebrovascular infections associated with the presence of microorganisms in cerebrospinal fluid (ventriculitis). What is especially dangerous for the patients health is the formation of biofilms by microorganisms on the catheters. Objectives: The aim of the study was to evaluate the intensity of single- and double-species biofilms formation on IVCs by Staphylococcus aureus (SAU), Escherichia coli (ECO) with K1 antigen, and Listeria monocytogenes (LMO). Methods: The research material was 15 strains of S. aureus, L. monocytogenes, and E. coli with K1 antigen, each. Evaluation of biofilm formation was performed on sterile fragments of IVCs with 1 cm length. The intensity of biofilm formation by the tested strains was determined with the quantitative method using sonication for removal of bacteria from IVCs surface. Biofilm formation ability was verified individually for each of the tested bacteria strain and for SAU + LMO, SAU + ECO, LMO + ECO combinations. Randomly selected fragments of biofilm-coated catheters were subjected to scanning electron microscopy (SEM). Results: The number of bacteria isolated from single-species biofilms on the IVCs surface ranged from 3.79 × 107 do 8.95 × 107 CFU × cm-2, depending on the species of microorganism. The strongest biofilm formed ECO with K1 antigen strains and the weakest - LMO strains. The scomposition of multi-species biofilms significantly influences the intensity of biofilm formation by strains from the examined species. In the SAU + LMO combination, strains from both species formed biofilm more intensively than in single-species variant. In turn, ECO has shown a significant inhibitory effect on biofilm formation by other tested species. Conclusions: It was stated that bacteria form biofilm on IVCs and it is a significant medical problem. The species composition of multi-species biofilms significantly influences the number of individual bacteria recovered from this biofilm. Intraventricular catheters (IVCs) are an important diagnostic and therapeutic tool. They allow continuous monitoring of intracranial pressure and drainage of cerebrospinal fluid (1). They are used in patients after traumatic brain injury, intracranial hemorrhage, ventricular, or hydrocephalus. They also allow intraventricular chemotherapy in case of central nervous system lymphoma (1, 2). The use of IVCs may lead to the development of bacterial brain and cerebrovascular infections associated with the presence of microorganisms in cerebrospinal fluid (ventriculitis) (3-5). These infections are caused mainly by Gram-positive (Staphylococcus spp., Corynebacterium spp., Bacillus spp., Propionibacterium spp., Listeria monocytogenes, Micrococcus spp. ), and Gram-negative bacteria (Escherichia coli, Klebsiella spp., Enterobactercloacae, Proteus mirabilis, Serratia marcescens) (6). Among catheterized patients, the incidence of such ventriculostomy-related infections (VRIs) varies from 0% - 22% (5, 7). What is especially dangerous for patients’ health is the formation of biofilms by microorganisms on the catheters. Biofilm is a multicellular bacterial structure surrounded by a polymeric matrix. In this form, the bacteria can be attached to abiotic surfaces or living tissues. Biofilm-forming microorganisms can settle dental implants, catheters, pacemakers, arthrodes, and other biomaterials (8, 9). Biofilm-forming microorganisms often cause infections difficult to detect using conventional culture methods (10). The characteristic feature of bacterial cells in biofilm is their antimicrobial resistance. They show much less susceptibility to toxic, bacteriostatic, or bactericidal substances than planktonic forms of microorganisms. This is an important factor hindering the treatment of infections caused by biofilm-forming bacteria (11, 12). Staphylococcus aureus can cause infections associated with the placement of intraventricular catheters. Prospective studies showed that among 1333 patients with external ventricular drains (EVD) or lumbar drains, 26 patients (2.0%) had meningitidis, of which 25.0% were caused by S. aureus (13). In recent years, L. monocytogenes has become an increasingly common cause of meningoencephalitis worldwide. The incidence rate is estimated at 0.05 and 0.2 cases per 100000 population (14). The main cause of cases number increase may be the increasing number of the elderly or people with reduced immunity. Escherichia coli, including E. coli with K1 antigen, is one of the most common causes of meningitidis in neonates (15). Escherichia coli are also isolated from meningitidis from adults (16). Lu et al. (17) showed an increase in the importance of Gram-negative rods in infections in post-neurosurgical patients, including E. coli. There is no data available on the biofilm formation on IVCs in available literature. This study complements the knowledge in this subject. The aim of the study was to evaluate the intensity of single- and double-species biofilms formation on IVCs by S. aureus (SAU), E. coli with K1 antigen (ECO), and L.monocytogenes (LMO). Biofilm formation ability was verified individually for each of the tested bacteria strain and for SAU + LMO, SAU + ECO, LMO + ECO combinations. The intensity of biofilm formation by the tested strains was determined with quantitative method. The carried out studies concerned only and exclusively bacterial strains and were carried out in vitro. These strains were obtained as part of the other studies in the past. In the described experiment, no material was taken from patients and no research was conducted on humans and animals. In the polish legislation, such studies do not require the consent of the bioethical commission. The research material was 15 strains of SAU, LMO, and ECO, each. Tested strains were isolated from cerebrospinal fluid or blood from patients. The strains came from the collection of department of microbiology, L. Rydygier Collegium Medicum in Bydgoszcz of Nicolaus Copernicus University in Torun. Evaluation of biofilm formation was performed on sterile fragments of IVCs with 1 cm length. The catheters were cut and sterilized radically using a high energy electron beam. The intensity of biofilm formation by the tested strains was determined with quantitative method, as Kwiecinska-Pirog et al. (18) previously described with some modifications. Biofilm formation ability was verified individually for each of the tested bacteria strains and for SAU + LMO, SAU + ECO, LMO + ECO combinations. Sterile prepared fragments of the catheters were placed in tubes containing 3 ml of bacterial suspension with 0.5 McF in the brain heart infusion broth (BHI) (Becton-Dickinson). As a negative control, a sterile fragment of the catheter was used and placed in a sterile BHI. Incubation was carried out for 72 hours at 37°C in an oxygen atmosphere with a change of the broth for a sterile one every 24 hours. Each time the BHI was changed, the catheters were washed with sterile phosphate buffered saline (PBS) pH 7.2 (Avantor) to remove planktonic cells. After 72 hours, the samples were washed twice with PBS at pH 7.2 and placed in 0.5% saponin solution (Sigma-Aldrich). Next, they were sonicated for 20 minutes (Ultrasonic DU-4, Nickel-Electro) and shaking at 800 rpm for 5 minutes. From the obtained suspensions, a series of 10-fold dilutions were made in PBS and then plated onto Chapman agar (Becton-Dickinson) for SAU, MacConkey agar (Becton-Dickinson) for ECO, and Columbia agar with 5% sheep blood (bioMerieux) for LMO. After 24 hours of incubation at 37°C in the aerobic atmosphere, colonies grown on suitable media were counted. The results were presented as the number of colony forming units per 1 cm-2 of catheter surface (CFU × cm-2). Randomly selected fragments of biofilm-coated catheters, prepared according to the method described above, were subjected to scanning electron microscopy (SEM). The samples preparation and observation procedure was previously described by Reslinski et al. (19). For this purpose, they were washed with sterile PBS at pH 7.2 and then fixed in 2.5% glutaraldehyde (Avantor) in 0.1 M phosphate buffer at pH 7.4 for 48 hours at 4°C. After fixation, catheter fragments were washed 2 times for 20 minutes at room temperature in phosphate buffer and dehydrated in ethanol with increasing concentrations of 30%, 50%, 70%, 80%, and 96% after 10 minutes and 2 times in ethanol with 99.8% (Avantor) for 30 minutes. Next, the samples were transferred to a solution of hexamethyldisilazane (Hexamethyldisilazane, HMDS) (Polysciences) for 45 minutes and dried at room temperature. Dried catheter fragments were placed on copper tables and sprayed with gold under argon in an ionic sprayser Fine Coater JCF-1200 (JEOL). After transferring samples to the JSM-5310LV electron microscope (JEOL), a 15 or 20 kV test was performed and the results were analyzed and recorded using software NSS Version 3.0 (Thermo Fisher Scientific). The analysis of the obtained results was carried out using the STATISTICA 12 PL (StatSoft) program based on Bonferroni post-hoc test, assuming significance level α = 0.05. All tested bacteria formed biofilm on the IVCs surface, however the intensity of its formation is being dependent on both the species and the strain of the microorganism. 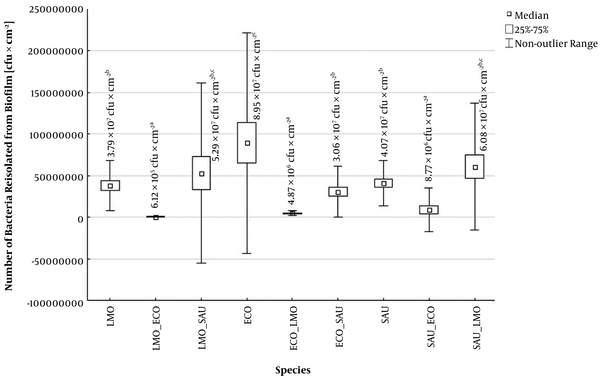 The number of bacteria isolated from single-species biofilms on the IVCs surface ranged from 3.79 × 107 to 8.95 × 107 CFU × cm-2, depending on the species of microorganism. The strongest biofilm formed ECO with K1 antigen strains and the weakest - LMO strains (Figure 1). Figure 1. Number of bacteria isolated from single- and double-species biofilms on intraventricular catheters (ECO - Escherichia coli, LMO - Listeria monocytogenes, SAU - Staphylococcus aureus, ECO + LMO - E. coli isolated from biofilm co-formed with L. monocytogenes, ECO + SAU - E. coli isolated from biofilm co-formed with S. aureus, LMO + ECO - L. monocytogenes isolated from biofilm co-formed with E. coli, LMO+SAU - L. monocytogenes isolated from biofilm co-formed with S. aureus, SAU+ECO - S. aureus isolated from biofilm co-formed with E. coli, SAU+LMO - S. aureus isolated from biofilm co-formed with L. monocytogenes). The composition of multi-species biofilms significantly influences the intensity of biofilm formation by strains from the examined species. In the SAU + LMO combination, strains from both species formed biofilm more intensively than in single-species variant. From the mixed biofilm, 5.29 × 107 CFU × cm-2 of LMO and 6.08 × 107 CFU × cm-2 of SAU were isolated. However, the differences observed were not statistically significant (P > 0.05) (Figure 1). In turn, ECO has shown a significant inhibitory effect on biofilm formation by other tested species. From ECO mixed biofilms, LMO were isolated in 6.12 × 105 CFU × cm-2 and SAU - 8.77 × 106 CFU × cm-2 (Figure 1). Moreover, ECO, unlike the other tested bacteria, form the biofilm statistically significantly stronger in single- than in double-species variant (Figure 1). The obtained results have been confirmed by the images of bacterial biofilms on the IVCs surface under the electron microscope (Figure 2 - 3). The infections are very serious complications that may occur after IVCs usage. Lyke et al. (1) showed that out of 196 cases of IVCs usage, 11 (5.6%) ended up with an infection. A recent large study on the incidence of infections following the introduction of an external ventriculostomy catheter was conducted by Bota et al. (7), who showed an incidence of infection at 9.0%. The most common cause of IVC-related ventriculitis are Gram-positive bacteria. Among them, the most common are S. aureus and coagulase-negative staphylococci (20). For the first time, Stoodley et al. (21) demonstrated the development of S. aureus biofilm on EVD surface in 2009. Placing the catheter for a long time may cause an infection. Biofilm formation on the surface of the catheter by microorganisms poses a threat to the life and health of the patient. In diagnosing IVC-related infections, the problem is the isolation of microorganisms from the surface of the catheter. Jost et al. (22) showed that the sonication of the removed catheter fragments increased the number of positive samples (64%, 9/14) compared to the CSF aspirate (14%, 2/14). In the own study, sonication was also used to detach biofilm cells from the surface of the catheters. By using this method it has been shown that biofilm formation ability varies from species to species. The most intensively biofilm formed species was E. coli with K1 antigen. Escherichia coli rods are often described as a model organism capable of producing biofilms on abiotic surfaces. This is possible thanks to many cell wall components such as: flagella, type I fimbriae, outer membrane proteins, colanic acid, and poly (β-1, 6-GlcNAc) (8, 23). Reisner et al. (24) observed a high variability in biofilm formation among isolates obtained from healthy people, people with diarrhea, bacteriemia, and urinary tract infections. There was no link observed between increased invitro biofilm formation ability and an origin of strains from a particular group. In our own study, the weakest biofilm on the surface of the catheters form L. monocytogenes. In 2011 Le Monnier et al. (25) described the case of a 3-year-old boy with ventriculoperitoneal shunt who had an infection with L. monocytogenes. This rod is able to form biofilms on many abiotic surfaces (26). Our study confirmed that IVCs may also be colonized by this microorganism. Due to the fact that L. monocytogenes can exceed three physiological barriers: intestinal barrier, blood-brain barrier, and placental barrier, listeriosis may manifest as a severe invasive form - occurring with CNS infection (27). The most important aspect of this study was the use of a two-species biofilm model. In our research, we have observed a change in the biofilm formation ability of the tested microorganisms in mixed biofilms. Staphylococcus aureus and L. monocytogenes formed a biofilm more intensively than in single-species variant. In addition, the inhibitory effects of E. coli on other species in mixed biofilms have been demonstrated. These are preliminary studies and they require confirmation and investigation by other methods, although the observed correlation seems interesting. Moreover, the observed correlations were also visualized with SEM. This is a method previously used for biofilm imaging on different catheter surfaces, including EVDs (28, 29). However, with the SEM technique, the viability of microbes and the identification of specific species cannot be determined. Still, in some cases, it is one of the few methods to visualize biofilm formation on the catheter surface, as demonstrated by Mounier et al. (29). In conclusion, it was stated that biofilm on IVCs is a significant medical problem. The species composition of multi-species biofilms significantly influences the number of individual bacteria recovered from this biofilm. There is no data available on the biofilm formation on IVCs in the available literature. Therefore, it is reasonable to conduct research to determine biofilm formation on this type of surface through various species of microorganisms and then to seek methods to limit its formation. Our research is the first study related to biofilm formation on IVCs, both for single-species and multi-species biofilms. In addition, in the study, bacterial strains that could cause nervous system infections and derived from the cerebrospinal fluid were used. The carried out research is preliminary and should be continued. The antibiotics resistance of biofilms on IVCs should be investigated and the interaction of species included in the biofilm should be explained. The study was supported by Collegium Medicum Nicolaus Copernicus University Grant No. MN-1/WF/2016 and by the Nicolaus Copernicus University with funds from the maintenance of the research potential of the department of microbiology DS-UPB no. 782. Authors’ Contribution: Krzysztof Skowron prepared the conception and design of the study, took part in the analysis and interpretation of data, provided the study material, collected the raw data (doing experiments), made a statistical analysis and critical revision of the article for important intellectual content, took part in final approval of the study, technical and logistical support, guaranteed the integrity of the entire study, and obtained funding for the study. Katarzyna Grudlewska took part in the analysis and interpretation of the obtained data, provided study material and collected raw data (doing experiments), took part in manuscript preparation. Agnieszka Kaczmarek collected raw data (doing experiments) and made a critical revision of the article for important intellectual content. Anna Budzynska collected raw data (doing experiments) and made a critical revision of the article for important intellectual content. Adrian Reslinski provided study material and collected raw data (doing experiments). Eugenia Gospodarek-Komkowska made a critical revision of the article for important intellectual content and final approval of the study, obtained funding for the study, and provided the administrative and logistical support as well as the integrity of the entire study. Financial Disclosure: Authors have no financial interests related to the material. 1. Lyke KE, Obasanjo OO, Williams MA, O'Brien M, Chotani R, Perl TM. Ventriculitis complicating use of intraventricular catheters in adult neurosurgical patients. Clin Infect Dis. 2001;33(12):2028-33. doi: 10.1086/324492. [PubMed: 11712094]. 2. Honda H, Jones JC, Craighead MC, Diringer MN, Dacey RG, Warren DK. Reducing the incidence of intraventricular catheter-related ventriculitis in the neurology-neurosurgical intensive care unit at a tertiary care center in St Louis, Missouri: an 8-year follow-up study. Infect Control Hosp Epidemiol. 2010;31(10):1078-81. doi: 10.1086/656377. [PubMed: 20731597]. 3. Fotakopoulos G, Makris D, Chatzi M, Tsimitrea E, Zakynthinos E, Fountas K. Outcomes in meningitis/ventriculitis treated with intravenous or intraventricular plus intravenous colistin. Acta Neurochir (Wien). 2016;158(3):603-10. discussion 610. doi: 10.1007/s00701-016-2702-y. [PubMed: 26801512]. 4. Beer R, Lackner P, Pfausler B, Schmutzhard E. Nosocomial ventriculitis and meningitis in neurocritical care patients. J Neurol. 2008;255(11):1617-24. doi: 10.1007/s00415-008-0059-8. [PubMed: 19156484]. 5. Holloway KL, Barnes T, Choi S, Bullock R, Marshall LF, Eisenberg HM, et al. Ventriculostomy infections: the effect of monitoring duration and catheter exchange in 584 patients. J Neurosurg. 1996;85(3):419-24. doi: 10.3171/jns.1996.85.3.0419. [PubMed: 8751626]. 6. Kubilay Z, Amini S, Fauerbach LL, Archibald L, Friedman WA, Layon AJ. Decreasing ventricular infections through the use of a ventriculostomy placement bundle: experience at a single institution. J Neurosurg. 2013;118(3):514-20. doi: 10.3171/2012.11.JNS121336. [PubMed: 23259820]. 7. Bota DP, Lefranc F, Vilallobos HR, Brimioulle S, Vincent JL. Ventriculostomy-related infections in critically ill patients: a 6-year experience. J Neurosurg. 2005;103(3):468-72. doi: 10.3171/jns.2005.103.3.0468. [PubMed: 16235679]. 8. Bazaka K, Jacob MV, Crawford RJ, Ivanova EP. Efficient surface modification of biomaterial to prevent biofilm formation and the attachment of microorganisms. Appl Microbiol Biotechnol. 2012;95(2):299-311. doi: 10.1007/s00253-012-4144-7. [PubMed: 22618687]. 9. Thomsen TR, Hall-Stoodley L, Moser C, Stoodley P. The Role of Bacterial Biofilms in Infections of Catheters and Shunts. Biofilm Infections. 2011. p. 91-109. doi: 10.1007/978-1-4419-6084-9_6. 10. Parsek MR, Singh PK. Bacterial biofilms: an emerging link to disease pathogenesis. Annu Rev Microbiol. 2003;57:677-701. doi: 10.1146/annurev.micro.57.030502.090720. [PubMed: 14527295]. 11. de la Fuente-Nunez C, Reffuveille F, Fernandez L, Hancock RE. Bacterial biofilm development as a multicellular adaptation: antibiotic resistance and new therapeutic strategies. Curr Opin Microbiol. 2013;16(5):580-9. doi: 10.1016/j.mib.2013.06.013. [PubMed: 23880136]. 12. Hoiby N, Bjarnsholt T, Givskov M, Molin S, Ciofu O. Antibiotic resistance of bacterial biofilms. Int J Antimicrob Agents. 2010;35(4):322-32. doi: 10.1016/j.ijantimicag.2009.12.011. [PubMed: 20149602]. 13. Scheithauer S, Burgel U, Ryang YM, Haase G, Schiefer J, Koch S, et al. Prospective surveillance of drain associated meningitis/ventriculitis in a neurosurgery and neurological intensive care unit. J Neurol Neurosurg Psychiatry. 2009;80(12):1381-5. doi: 10.1136/jnnp.2008.165357. [PubMed: 19293173]. 14. Pelegrin I, Moragas M, Suarez C, Ribera A, Verdaguer R, Martinez-Yelamos S, et al. Listeria monocytogenes meningoencephalitis in adults: analysis of factors related to unfavourable outcome. Infection. 2014;42(5):817-27. doi: 10.1007/s15010-014-0636-y. [PubMed: 24902522]. 15. Yao Y, Xie Y, Kim KS. Genomic comparison of Escherichia coli K1 strains isolated from the cerebrospinal fluid of patients with meningitis. Infect Immun. 2006;74(4):2196-206. doi: 10.1128/IAI.74.4.2196-2206.2006. [PubMed: 16552050]. [PubMed Central: PMC1418925]. 16. Yang TM, Lu CH, Huang CR, Tsai HH, Tsai NW, Lee PY, et al. Clinical characteristics of adult Escherichia coli meningitis. Jpn J Infect Dis. 2005;58(3):168-70. [PubMed: 15973009]. 17. Lu CH, Chang WN, Chuang YC, Chang HW. Gram-negative bacillary meningitis in adult post-neurosurgical patients. Surg Neurol. 1999;52(5):438-43. discussion 443-4. doi: 10.1016/S0090-3019(99)00129-9. [PubMed: 10595761]. 18. Kwiecinska-Pirog J, Bogiel T, Gospodarek E. [Evaluation of biofilm formation by Proteus mirabilis strains on the surface of different biomaterials by two methods]. Med Dosw Mikrobiol. 2011;63(2):131-8. Polish. [PubMed: 22184907]. 19. Reslinski A, Dabrowiecki S, Głowacka K, Szmytkowski J. The influence of octenidine dihydrochloride on bacterial biofilm on the surface of a polypropylene mesh. Med Biol Sci. 2013;27(2):41-7. doi: 10.2478/mbs-2013-0015. 20. Stenager E, Gerner-Smidt P, Kock-Jensen C. Ventriculostomy-related infections--an epidemiological study. Acta Neurochir (Wien). 1986;83(1-2):20-3. doi: 10.1007/BF01420503. [PubMed: 3799246]. 21. Stoodley P, Braxton EE Jr, Nistico L, Hall-Stoodley L, Johnson S, Quigley M, et al. Direct demonstration of Staphylococcus biofilm in an external ventricular drain in a patient with a history of recurrent ventriculoperitoneal shunt failure. Pediatr Neurosurg. 2010;46(2):127-32. doi: 10.1159/000319396. [PubMed: 20664301]. [PubMed Central: PMC2939992]. 22. Jost GF, Wasner M, Taub E, Walti L, Mariani L, Trampuz A. Sonication of catheter tips for improved detection of microorganisms on external ventricular drains and ventriculo-peritoneal shunts. J Clin Neurosci. 2014;21(4):578-82. doi: 10.1016/j.jocn.2013.05.025. [PubMed: 24326253]. 23. Van Houdt R, Michiels CW. Role of bacterial cell surface structures in Escherichia coli biofilm formation. Res Microbiol. 2005;156(5-6):626-33. doi: 10.1016/j.resmic.2005.02.005. [PubMed: 15950122]. 24. Reisner A, Krogfelt KA, Klein BM, Zechner EL, Molin S. In vitro biofilm formation of commensal and pathogenic Escherichia coli strains: impact of environmental and genetic factors. J Bacteriol. 2006;188(10):3572-81. doi: 10.1128/JB.188.10.3572-3581.2006. [PubMed: 16672611]. [PubMed Central: PMC1482849]. 25. Le Monnier A, Blanot S, Abachin E, Beretti JL, Berche P, Kayal S. Listeria monocytogenes: a rare complication of ventriculoperitoneal shunt in children. J Clin Microbiol. 2011;49(11):3924-7. doi: 10.1128/JCM.01083-11. [PubMed: 21918024]. [PubMed Central: PMC3209090]. 26. Reis-Teixeira FBD, Alves VF, de Martinis ECP. Growth, viability and architecture of biofilms of Listeria monocytogenes formed on abiotic surfaces. Braz J Microbiol. 2017;48(3):587-91. doi: 10.1016/j.bjm.2017.01.004. [PubMed: 28237677]. [PubMed Central: PMC5498454]. 27. Renier S, Hebraud M, Desvaux M. Molecular biology of surface colonization by Listeria monocytogenes: an additional facet of an opportunistic Gram-positive foodborne pathogen. Environ Microbiol. 2011;13(4):835-50. doi: 10.1111/j.1462-2920.2010.02378.x. [PubMed: 21087384]. 28. Ramirez P, Gordon M, Soriano A, Gil-Perotin S, Marti V, Gonzalez-Barbera EM, et al. Assessment of the in vivo formation of biofilm on external ventricular drainages. Eur J Clin Microbiol Infect Dis. 2013;32(11):1437-43. doi: 10.1007/s10096-013-1895-8. [PubMed: 23708953]. 29. Mounier R, Kapandji N, Birnbaum R, Cook F, Rodriguez C, Nebbad B, et al. Biofilm-associated infection: the hidden face of cerebrospinal fluid shunt malfunction. Acta Neurochir (Wien). 2016;158(12):2321-4. doi: 10.1007/s00701-016-2977-z. [PubMed: 27699486].